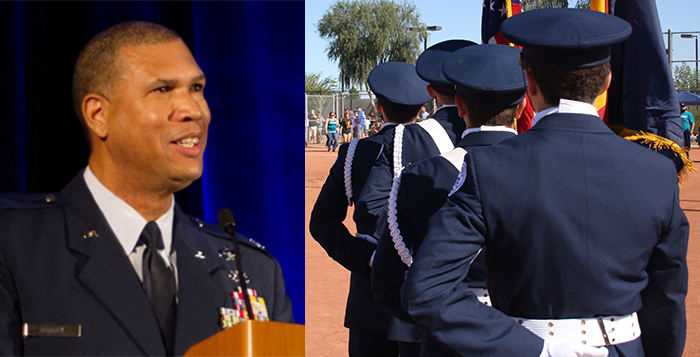 Lt. Col. Allen Kirksey has taken command early of Maricopa High School's Air Force Jr. ROTC program. “This is my calling. This is my passion,” Lt. Col. Allen Kirksey said of his new position at Maricopa High School. Kirksey is the new leader of the Air Force Junior Reserve Officers Training Corps (Jr. ROTC). He replaces Maj. James Alonzo, who is retiring. He said being able to “get my feet wet” by substituting the last two months of the school year has allowed him to get set up in the MHS system instead of trying to get organized in August. Kirksey enlisted in the U.S. Air Force out of high school in 1979. He re-enlisted in the Air National Guard in 1984. 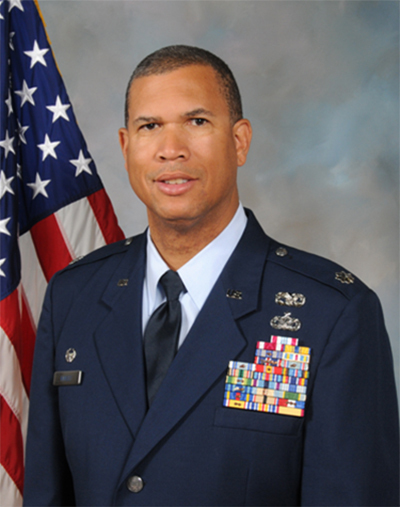 He was commander of the 161st Security Forces Squadron. Kirksey was deployed as the wing senior intelligence officer in support of Operation Desert Shield, Deny Flight, Phoenix Scorpion and Southern Watch. When he retired in 2015 he was the wing chief of staff. A product of the Arizona school system, Kirksey has volunteered hundreds of hours at Phoenix area high schools. “I’ve been working for kids for years,” he said. His wife, a sixth-grade teacher, has taught in Phoenix for 23 years. When Alonzo announced he was retiring, Kirksey felt he was in the right place at the right time to take the reins of the Jr. ROTC program in Maricopa. “He brings a very distinguished career to Maricopa High School,” Chestnut said. Kirksey earned the Meritorious Service Medal twice. In 2011, he received the Excellence in Diversity Award, which recognizes service members who contribute to mission readiness and diversity initiatives that impact the National Guard, state and local community. In 2014, he received the Calvin C. Goode Lifetime Achievement Award from the City of Phoenix. He has a bachelor’s degree from University of Phoenix. Kirksey has already accompanied 53 MHS cadets to an air show at Luke Air Force Base. Next school year, he anticipates a return to Luke to tour the F-35 and the F-15 and try out the simulators. Also on the schedule is a trip to Davis-Montham Air Force Base in Tucson to tour an A-10 Warthog, a trip to Fort Huachuca to see the Predator unmanned aerial vehicle, then back to Phoenix to see a KC-135 Stratotanker. Fifteen cadets may get to go on an air-refueling mission.